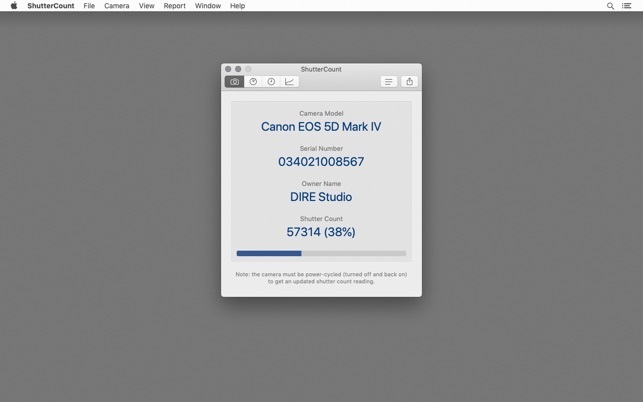 ShutterCount displays the number of shutter actuations (the shutter count) of your Canon EOS, Nikon or Pentax digital camera - see the complete list of supported models below. 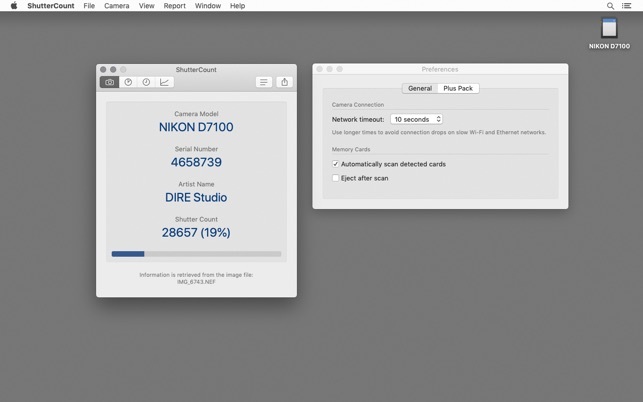 The shutter count is read directly from USB or Wi-Fi connected Canons, and from image files for Nikon and Pentax cameras. With ShutterCount you can easily check whether a newly purchased camera is really new, or check how heavily used a pre-owned item is. And you can save a trip to a service center by doing the reading for yourself. 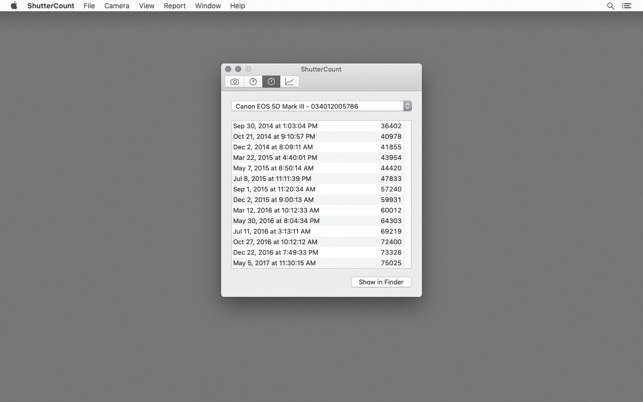 ShutterCount provides unlimited readings for your cameras. The app displays the count for still photos by default - purchase the optional Live View Pack to get additional counters that also cover videos. 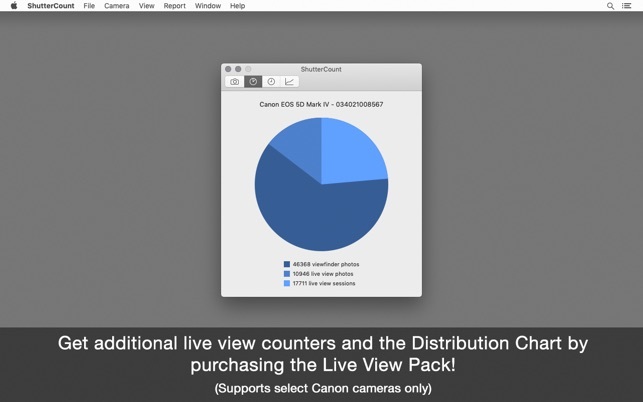 The Live View Pack is available as an in-app purchase for select Canon models. History logging allows you to track camera usage. Logs are stored in CSV format that can be imported into Apple's Numbers or Microsoft Excel for further processing. The optional Plus Pack enables additional features: shutter count graphing & forecasting, history log duplicate removal, camera date/time synchronization (Canon only) and outdated firmware version warning (Canon only). The Plus Pack is available as an in-app purchase. • Canon EOS-1D IV, 1D C, 1D X, 1D X II, 5D II, 5D III, 5D IV, 5DS, 5DS R, 6D, 6D II, 7D, 7D II, 40D, 50D, 60D, 70D, 77D, 80D, 100D, 200D, 450D, 500D, 550D, 600D, 650D, 700D, 750D, 760D, 800D, 1000D, 1100D, 1200D, 1300D, 1500D, 2000D, 8000D, 9000D, M50, R; Kiss F, M, X2, X3, X4, X5, X6i, X7, X7i, X8i, X9, X9i, X50, X70, X80; Rebel SL1, SL2, T1i, T2i, T3, T3i, T4i, T5, T5i, T6, T6i, T6s, T7, T7i, XS, XSi. • Canon 1D C, 1D X, 5D III, 5D IV, 5DS, 5DS R, 6D, 6D II, 7D II, 70D, 77D, 80D, 200D, 800D, 9000D, M50, R; Kiss X9, X9i; Rebel SL1, T7i. Built-in Wi-Fi must be disabled when connected via USB as it blocks the USB port when enabled. Please quit all applications that might connect to your camera (e.g. 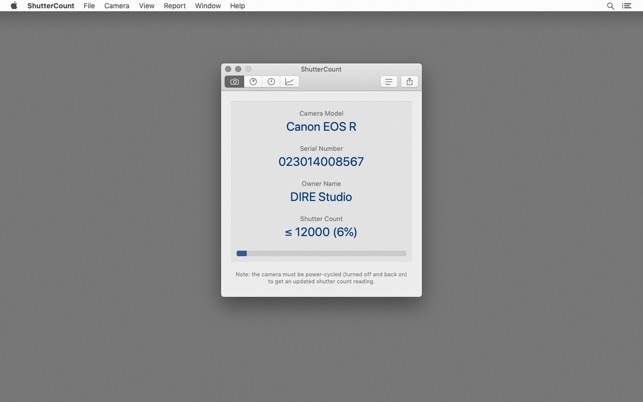 Kuuvik Capture, EOS Utility, Capture One, Lightroom) before launching ShutterCount. • Nikon D2H, D2X, D2Xs, D3, D3S, D3X, D4, D4S, D5, D40, D40X, D50, D60, D70, D70s, D80, D90, D200, D300, D300S, D500, D600, D610, D700, D750, D800, D800E, D810, D850, D3000, D3100, D3200, D3300, D3400, D3500, D5000, D5100, D5200, D5300, D5500, D5500, D7000, D7100, D7200, Df, Z6, Z7; 1 AW1, J1, J3, J4, J5, V1, V2, V3; Coolpix A. • Pentax *ist DL, *ist DL2, 645D, 645Z, K-1, K-1 II, K-3, K-3 II, K-5, K-5 II, K-5 IIs, K-7, K-30, K-50, K-70, K-500, K-m, K-r, K-S1, K-S2, K-x, K10D, K20D, K100D, K100D Super, K200D, K2000, KP. • Canon 1D II, 1D II N, 1D III, 1Ds II, 1Ds III. Cameras not listed here are not supported. Questions? Problems? Check out the Getting Started Guide (https://www.direstudio.com/shuttercount/getting-started), the FAQ (https://www.direstudio.com/shuttercount/faq), or contact our support! DISCLAIMER: The app displays the camera's internal counter. DIRE Studio is not responsible for how well and accurately the camera maintains that counter. The forecast is calculated based on your previous usage, and will change if you use the camera differently in the future. • Added support for Nikon D3500, Z6 and Pentax K-1 Mark II. • Improved, easier to read appearance on macOS 10.14. Der Support via E-Mail ist einwandfrei. Schnelle Reaktionszeit und Probleme wurden bestens gelöst. Das Programm macht genau was es machen soll. Den Preis finde ich jedoch etwas hoch, dafür dass auch nicht alle fubktionen dabei sind... aber gut. Das Auslesen funktioniert einwandfrei. Allerdings kostet die App Stand Juli 2018 sage und schreibe 4,50 Euro. Dabei sind noch nicht einmal alle Funktionen erhalten. Diese kosten jeweils noch einmal 4,50 pro Stück. Damit kommt die App am Ende auf 13,50 Euro für alle „Funktionen“. Das ist derart dreist, dafür fehlen mir die Worte. Copyright © 2013-2018 DIRE Studio Kft.